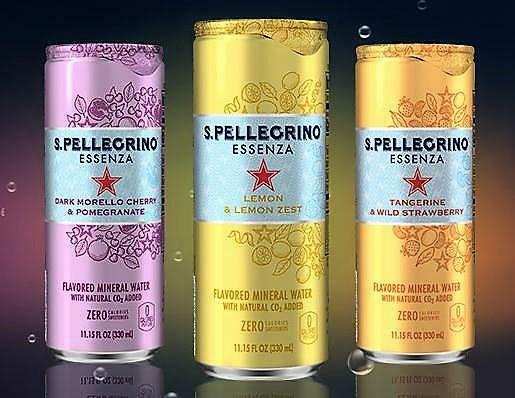 Nestle Waters has introduced S. Pellegrino Essenza, a flavored sparkling water in 330-ml cans, offering natural Mediterranean fruit flavors infused with gentle bubbles. The beverages are made from flavored mineral water with natural carbon dioxide and zero calorie sweeteners. Offerings include unflavored; lemon and zest; dark morello cherry and pomegranate; and tangerine zest and wild strawberry. The beverages are available from vending distributors, according to Bart Wassom, a Nestle Waters senior account manager. Certified Management Group is representing the product to the vending and micro market trade. Essenza, which means “essence” in Italian, offers a line of beverages that can be paired with meals. Meal pairing represents a growth opportunity for the sparkling water category. Lemon and lemon zest offers a citrus aroma and pairs with light flavored dishes such as shellfish, fresh greens and seasonal fruit. Tangerine and wild strawberry offers an aroma with citrusy zest of tangerine and wild strawberry, pairing with medium flavored dishes like sautéed vegetables, white meat or fresh pasta. Dark morello cherry and pomegranate offers a fine fruit aroma and pairs with more flavorful dishes like roasted vegetables, red meat, sandwiches and chocolate.